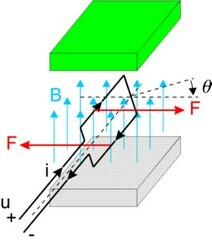 When permanent magnets are used in a motor, a magnetic field will be present with a magnetic flux density B. Suppose an electric coil is placed in this magnetic field. When an electric current i is forced to flow through this coil, a force acting on the coil will occur. In most literature the Kc(q) is calculated out of the magnetic field and coil distribution. Here it is simply assumed to be given and is called the torque function. By a proper design of the motor, i.e. geometry of the coil windings, magnets etc., the torque function Kc(q) can be given a particular shape. Then by proper manipulation of the current a positive torque can be created during the whole rotation of the coil. All permanent magnet motors are based on this principle.